DFRobot BME680 Environmental Sensor is a low power gas, pressure, temperature & humidity sensor based on BOSCH BME680 sensor. It is a 4-in-1 multi-functional MEMS environmental sensor which integrates VOC (Volatile Organic Compounds) sensor, temperature sensor, humidity sensor and barometer. With DFRobot Gravity BME680 Environmental Sensor, you can monitor 4 environmental parameters simultaneously at the most. It is designed for air quality monitor, and due to the MEMS technology, BME680 has a small size and low power consumption. It can be widely used in environmental monitoring, home automation and control, Internet of Things (IoT) wearable device, GPS enhancement, etc. 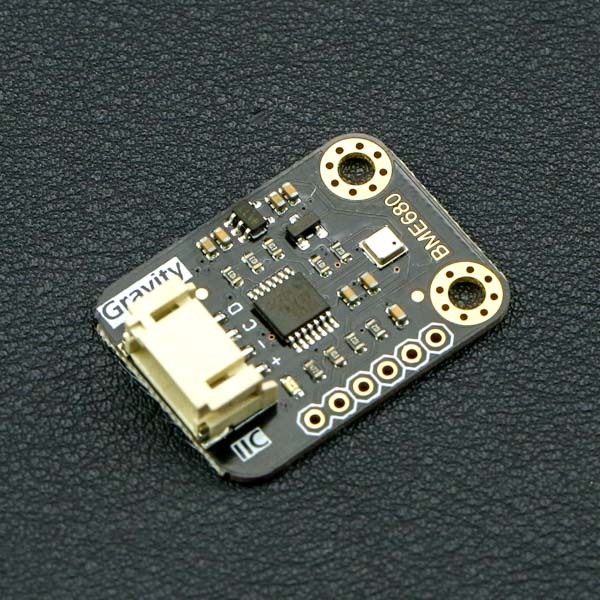 DFRobot Gravity BME680 environmental sensor provides a Gravity I2C connector, plug & play, easy to connect. With onboard voltage regulator IC and level translator IC, DFRobot Gravity BME680 environmental sensor shows good compatibility. 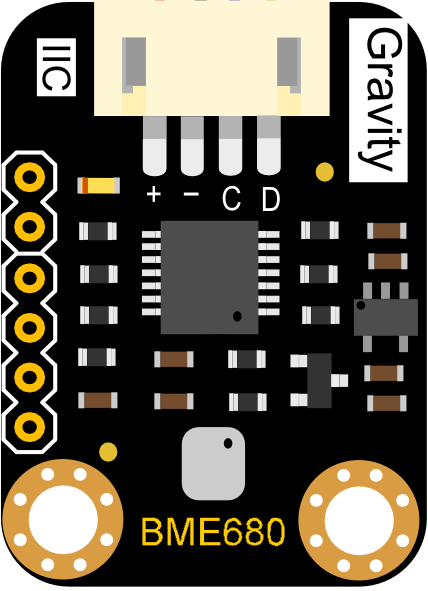 It can be directly connected to 3.3V and 5V systems. Moreover, there is also a SPI connector in reserve for further expansion projects. With the development of industrialization, air pollution is getting worse and worse. Toxic chemical odors are even common with new furniture. These invisible killers are destroying your health day by day. You do need to concern about your health as soon as possible and DFRobot Gravity BME680 environmental sensor can help make an air quality monitor. DFRobot Gravity BME680, take care of your health! This tutorial will demonstrate how to use this sensor. At present, only FireBeetle ESP8266 IOT Microcontroller can read IAQ, other controllers can not support. Download and install the BME680 Library. How to install the library? This product supports both IIC and SPI wiring connector. Please select suitable connector according to the wiring. Below is the connection diagram for your reference. IIC wiring connector is recommended, plug & play, easy to use. You must pay attention to the wiring order, VCC to Power Supply, GND to Ground. Program Function: read data from BME680 sensor and serial printing(without IAQ). 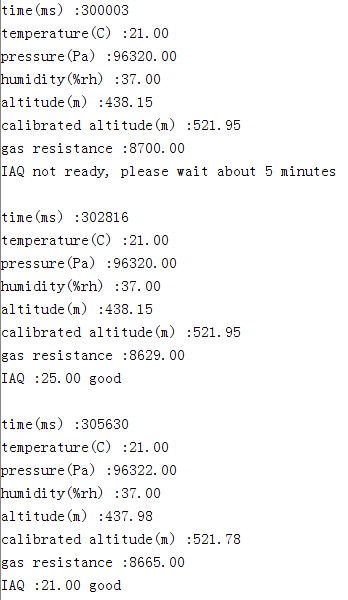 /*You can use an accurate altitude to calibrate sea level air pressure. *And then use this calibrated sea level pressure as a reference to obtain the calibrated altitude. *In this case,525.0m is chendu accurate altitude. Program Function: read data from BME680 sensor and serial printing(with IAQ). At present, only FireBeetle ESP8266 IOT Microcontroller can read IAQ, other controllers can not support. For FireBeetle ESP8266 IOT Microcontroller,please use Arduino IDE 1.8.x. Then update the SDK to 2.3.1 or above. Refer to section 4.2 of the FireBeetle ESP8266 Wiki for the tutorial. Create a bme object and write to IIC address. Query whether the IAQ conversion is complete. If Completed return 1, else return 0. 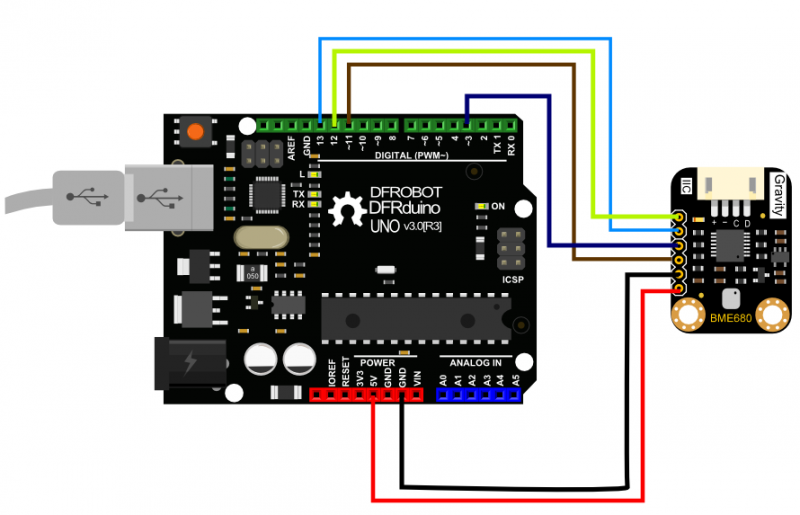 Get Gravity: I2C BME680 Environmental Sensor from DFRobot Store or DFRobot Distributor.